The long-awaited Honda Civic Type-R has now gone on sale in the UK, with customers able to place an order with a £3,000 deposit. The news follows what Honda describes as "unprecedented demand" for its latest hot hatch. The full price of the new model is yet to be confirmed by the Japanese marque. The new Civic Type-R was previewed at the recent Paris motor show, where it was showcased as a thinly veiled concept car. However, expect the racy styling, including the ground-hugging bodywork and outrageous rear spoiler, to make it to the production version largely unchanged when it arrives in showrooms late next year. Aside from its aggressive design, there is plenty more to the new Type-R that will appeal to performance car fans. 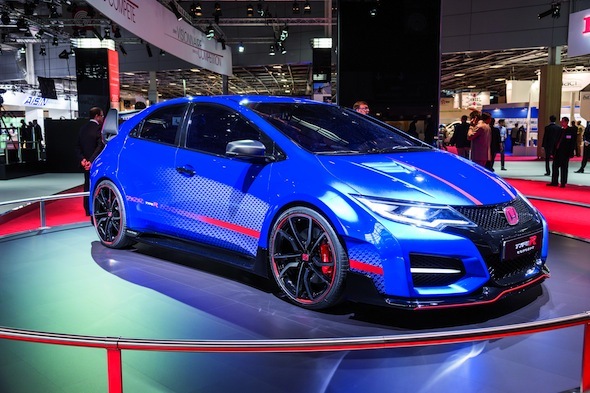 Honda claims it has been developed and engineered specifically for European drivers – the most prolific buyers of hot hatchbacks – and has been working hard to steal the crown from the Renaultsport Megane RS 275 as the fastest front-wheel-drive car around Germany's Nurburgring race track. Honda is remaining coy about the power output from the Type-R's turbocharged 2.0-litre engine, saying merely that it will be "more than 276bhp". However, Autocar reports that engineers have admitted the motor is easily capable of producing in excess of 300bhp – a figure that the Civic will have to achieve if it wants to hold its head high amongst its talented European rivals. Honda is also enjoying high demand for its forthcoming NSX supercar, for which more than 100 customers have already placed pre-orders. A launch date for that vehicle has yet to be confirmed.